Lakhtakia R, Al-Wahaibi K, Zahid KF, Malik KA, Burney IA. Solid Pseudopapillary Neoplasm of the Pancreas: A Case Report with Review of the Diagnostic Dilemmas and Tumor Behavior. Oman Med J 2013 Nov; 28(6):441-444. We report a case of SPN in which diagnosis was suspected on radiology and confirmed intra-operatively by cytology, enabling appropriate surgical management. The diagnostic dilemmas and current knowledge of the origins, behavior, and treatment options of this neoplasm are presented. A 23-year-old Omani female presented with gradually progressing, episodic, epigastric pain radiating to the right hypochondrium with recent accentuation. Pain was accompanied by anorexia and significant weight loss (5 kg in one month). There was no relationship to food or bowel movements. Her mother had died of metastatic gastric carcinoma. General and systemic examination revealed no abnormality. Of note, no mass could be palpated in the abdomen. Hematologic and metabolic parameters, including tumor markers were within normal limits. A CT scan of the abdomen and pelvis showed a 7.7 × 7.5 × 7 cm enhancing, rounded, well-defined cystic and solid lesion, located supero-anterior to the left kidney (Figs. 1A and B). The pancreatic tail was splayed and poorly delineated. The possibility of an epithelial solid and cystic pancreatic mass or a gastrointestinal stromal tumor (GIST) was entertained. A proposed endoscopic ultrasound and fine needle aspiration cytology of the mass was declined by the patient. Figure 1: CT scan abdomen and pelvis shows an enhancing, rounded, well defined, cystic (C) and solid (S) tumor located in proximity to the spleen; (1A) and supero-anterior to the left kidney; (1B) (arrowheads). Per-operatively, there was a large cyst at the tail of the pancreas adherent to the splenic artery and vein. The peritoneal cavity, liver and spleen were normal. The resected mass, sent for frozen section, was globular, 10 cm in diameter, well circumscribed, and solid brown on cut surface with a white nodule (Fig. 2A). There was no definite infiltration into the surrounding tissues. Intra-operatively, imprint cytology, showed a cellular tumor with sheets of monomorphic cells loosely aggregated around arborising vessels (Fig. 2B). The cells had uniform oval nuclei with occasional grooves and a pale cytoplasm. A diagnosis of solid pseudopapillary neoplasm of the pancreas was made. The patient underwent a spleen-preserving distal pancreatectomy of the lesion. 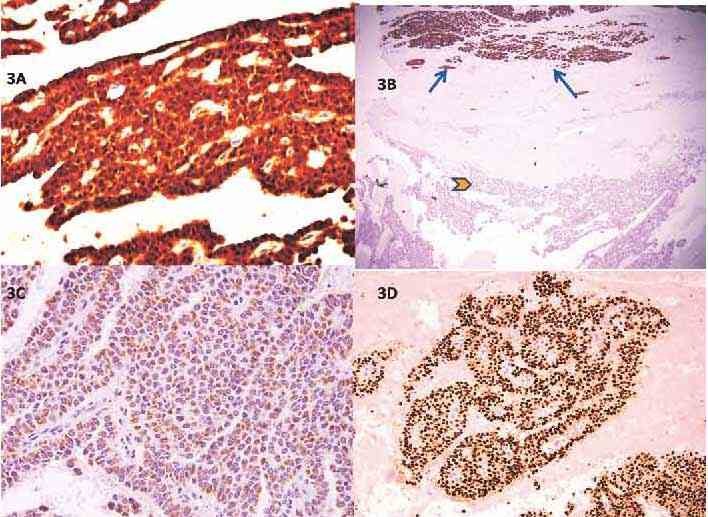 Figure 2: Solid pseudopapillary neoplasm (SPN) of the pancreas; macroscopic and microscopic appearance. (A) globular encapsulated tumor with solid brown areas and a whitish nodule; (B) Intraoperative imprint cytology shows the pseudopapillary arrangement of uniform cells around arborising vessels (Diff Quik × 40); (C) The tumor forms pseudorosettes and pseudopapillae projecting into cystic spaces (H&E × 40); (D)Tumor cells are polygonal with eosinophilic cytoplasm, vesicular nuclei with grooves with minimal atypia and occasional mitosis (arrow) (H&E × 400). Microscopically, there were solid and cystic areas with pseudorosetting and pseudopapillae formed by polygonal cells with eosinophilic cytoplasm, vesicular nuclei with grooves as well as minimal atypia and occasional mitosis (Figs. 2C-D). There were no necrobiotic cell nests. Perineural and capsular invasion were present but there was no vascular invasion. Immunophenotypic expression of beta catenin in the nuclei and absence of e-cadherin staining were the hallmarks (Figs. 3A-B). In addition, the tumor expressed progesterone receptor (Fig. 3C), vimentin, CD10 and CD56. Focal synaptophysin and chromogranin positivity was seen (Fig. 3D). Alpha-1 antitrypsin was focally expressed, and Ki67 proliferation rate was <1%. A diagnosis of solid pseudopapillary neoplasm of the pancreas was made. Features of aggressive behavior included size >5 cm, mitosis, capsular and perineural invasion. The patient made an uneventful post-operative recovery. Since the disease was localized and the excision was complete, the patient was not given adjuvant treatment, and shall be on regular follow-up. Figure 3: Immunophenotypic features of SPN. (A) Strong nuclear positivity for ß-catenin (DAB × 400); (B) The surrounding pancreatic tissue expressing e-cadherin (arrows) while the tumor is negative (arrowhead), (DAB × 40); (C) Weak, focal, granular cytoplasmic positivity for chromogranin in the tumor cells (DAB × 400); (D) Diffuse nuclear progesterone receptor (PR) positivity in the tumor cells (IHC with DAB ×100). 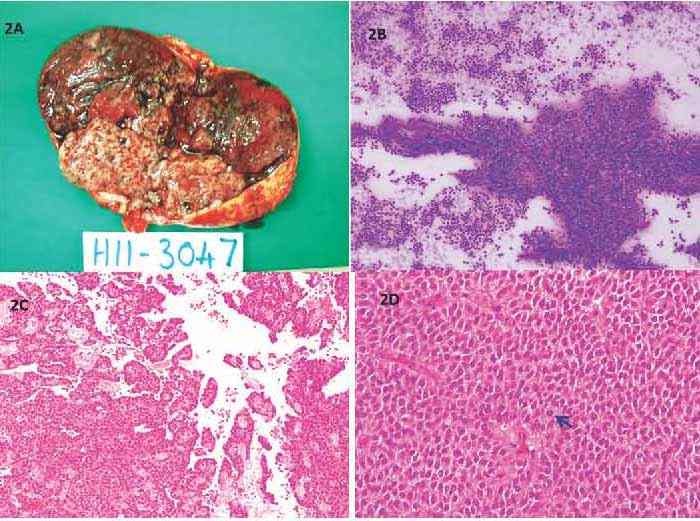 This case report on pseudopapillary neoplasm of the pancreas highlights the enigmatic histogenesis of this indolent neoplasm and the need to distinguish it from more aggressive pancreatic tumors that may be considered in the morphologic differential diagnosis. Characteristic mutations in the ß-catenin gene have proven useful in providing specificity of diagnosis. The excellent long term prognosis of this potentially malignant tumor underscores the need for an accurate morpho-immunophenotypic diagnosis (pre- or intra-operative) for planning definitive surgery that is curative in a majority of patients. 1. Edirimanne S, Connor SJ. Incidental pancreatic cystic lesions. World J Surg 2008 Sep;32(9):2028-2037. 3. Nguyen NQ, Johns AL, Gill AJ, Ring N, Chang DK, Clarkson A, et al. Clinical and immunohistochemical features of 34 solid pseudopapillary tumors of the pancreas. J Gastroenterol Hepatol 2011 Feb;26(2):267-274. 4. Raddaoui E. Clinical utility and diagnostic accuracy of endoscopic ultrasound-guided fine needle aspiration of pancreatic lesions: Saudi Arabian experience. Acta Cytol 2011;55(1):26-29. 5. Serra S, Chetty R. Revision 2: an immunohistochemical approach and evaluation of solid pseudopapillary tumour of the pancreas. J Clin Pathol 2008 Nov;61(11):1153-1159. 6. Song JS, Yoo CW, Kwon Y, Hong EK. Endoscopic ultrasound-guided fine needle aspiration cytology diagnosis of solid pseudopapillary neoplasm: three case reports with review of literature. Korean J Pathol 2012 Aug;46(4):399-406. 7. Kim MJ, Jang SJ, Yu E. Loss of E-cadherin and cytoplasmic-nuclear expression of beta-catenin are the most useful immunoprofiles in the diagnosis of solid-pseudopapillary neoplasm of the pancreas. Hum Pathol 2008 Feb;39(2):251-258. 8. Burford H, Baloch Z, Liu X, Jhala D, Siegal GP, Jhala N. E-cadherin/beta-catenin and CD10: a limited immunohistochemical panel to distinguish pancreatic endocrine neoplasm from solid pseudopapillary neoplasm of the pancreas on endoscopic ultrasound-guided fine-needle aspirates of the pancreas. Am J Clin Pathol 2009 Dec;132(6):831-839. 9. Chakhachiro ZI, Zaatari G. Solid-pseudopapillary neoplasm: a pancreatic enigma. Arch Pathol Lab Med 2009 Dec;133(12):1989-1993. 10. Huang SC, Wu TH, Chen CC, Chen TC. Spontaneous rupture of solid pseudopapillary neoplasm of the pancreas during pregnancy. Obstet Gynecol 2013 Feb;121(2 Pt 2)(Suppl 1):486-488. 11. Yu PF, Hu ZH, Wang XB, Guo JM, Cheng XD, Zhang YL, et al. Solid pseudopapillary tumor of the pancreas: a review of 553 cases in Chinese literature. World J Gastroenterol 2010 Mar;16(10):1209-1214. 12. Geers C, Moulin P, Gigot JF, Weynand B, Deprez P, Rahier J, et al. Solid and pseudopapillary tumor of the pancreas–review and new insights into pathogenesis. Am J Surg Pathol 2006 Oct;30(10):1243-1249. 13. Liu BA, Li ZM, Su ZS, She XL. Pathological differential diagnosis of solid-pseudopapillary neoplasm and endocrine tumors of the pancreas. World J Gastroenterol 2010 Feb;16(8):1025-1030. 14. Heiser PW, Cano DA, Landsman L, Kim GE, Kench JG, Klimstra DS, et al. Stabilization of beta-catenin induces pancreas tumor formation. Gastroenterology 2008 Oct;135(4):1288-1300. 15. Bergmann F, Andrulis M, Hartwig W, Penzel R, Gaida MM, Herpel E, et al. Discovered on gastrointestinal stromal tumor 1 (DOG1) is expressed in pancreatic centroacinar cells and in solid-pseudopapillary neoplasms–novel evidence for a histogenetic relationship. Hum Pathol 2011 Jun;42(6):817-823. 16. de Castro SM, Singhal D, Aronson DC, Busch OR, van Gulik TM, Obertop H, et al. Management of solid-pseudopapillary neoplasms of the pancreas: a comparison with standard pancreatic neoplasms. World J Surg 2007 May;31(5):1130-1135. 17. Guo N, Zhou QB, Chen RF, Zou SQ, Li ZH, Lin Q, et al. Diagnosis and surgical treatment of solid pseudopapillary neoplasm of the pancreas: analysis of 24 cases. Can J Surg 2011 Dec;54(6):368-374. 18. Igbinosa O. Pseudopapillary tumor of the pancreas. An algorithmic approach. JOP 2011 May;12(3):262-265. 19. Ansari D, Elebro J, Tingstedt B, Ygland E, Fabricius M, Andersson B, et al. Single-institution experience with solid pseudopapillary neoplasm of the pancreas. Scand J Gastroenterol 2011 Dec;46(12):1492-1497. 20. 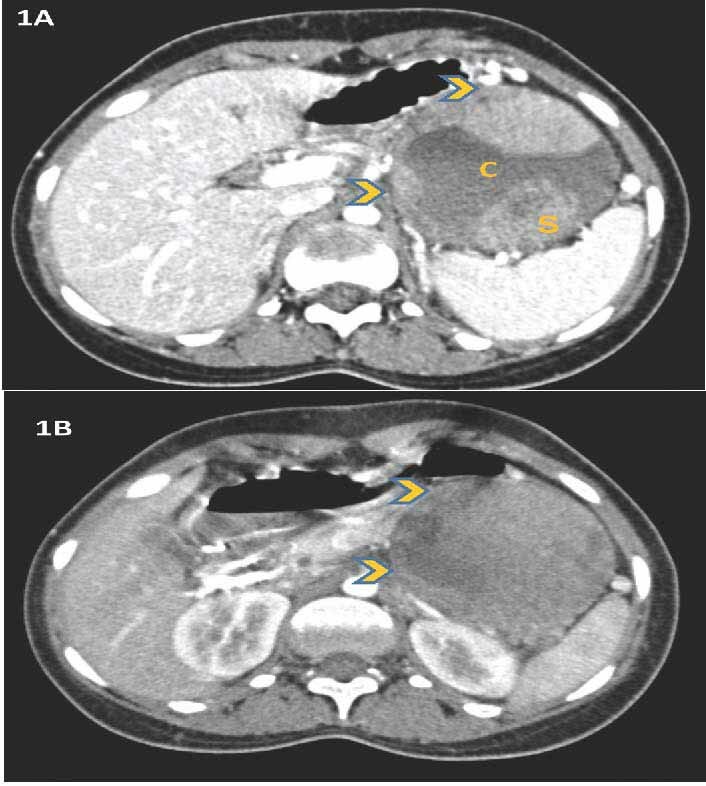 Sperti C, Berselli M, Pasquali C, Pastorelli D, Pedrazzoli S. Aggressive behaviour of solid-pseudopapillary tumor of the pancreas in adults: a case report and review of the literature. World J Gastroenterol 2008 Feb;14(6):960-965. 21. Jo H, Park WK, Lee NH, Choi JH. Preoperative chemotherapy and intraoperative radiofrequency ablation for unresectable solid pseudopapillary tumor of the pancreas. J Pediatr Hematol Oncol 2000;29:851-853. 22. Honore C, Goere D, Dartigues P, Burtin P, Dumont F, Elias D. Peritoneal carcinomatosis from solid pseudopapillary neoplasm (Frantz’s tumour) of the pancreas treated with HIPEC. Anticancer Res 2012 Mar;32(3):1069-1073. 23. Li JX, Wu H, Huang JW, Prasoon P, Zeng Y. Synchronous intraoperative radiofrequency ablation for multiple liver metastasis and resection of giant solid pseudopapillary tumors of the pancreas. Chin Med J (Engl) 2012 May;125(9):1661-1663.